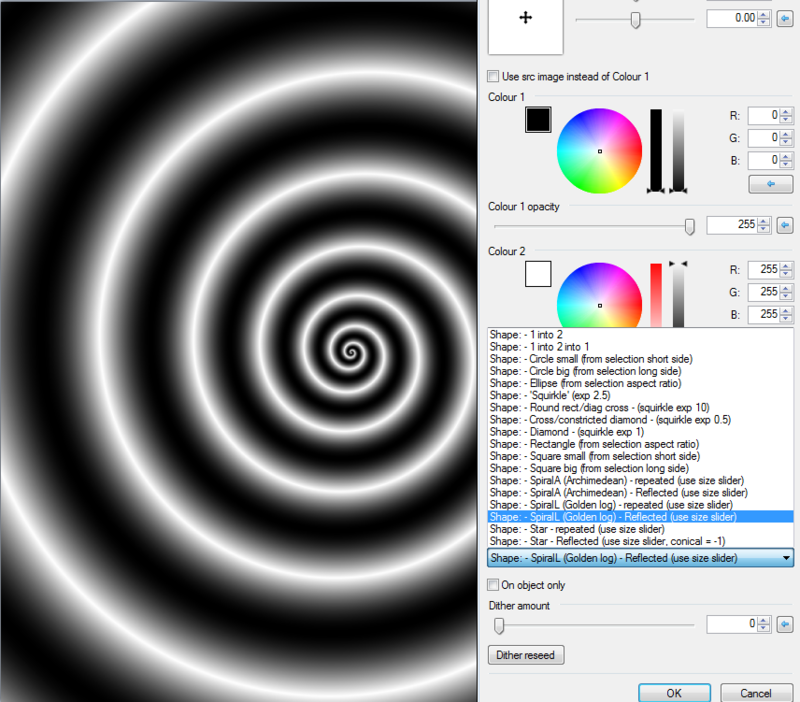 Firstly I would like to thank BoltBait for his encouragement to use HSV gradients and dithering in this plug-in. to write plug-ins at all! 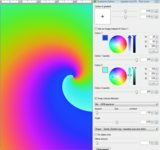 So what's wrong with the built in gradient tool? of the canvas - and plugins have the wonderful ability to 'remember' their last settings too (ideal for repeated tasks). choice of shapes, to act as 'vignette' type filters; ellipse, good old 'squirkle', diamond etc. choice of direct transition methods; linear,cosine & sinh. 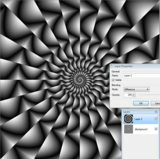 variable dithering (I've left a large range here because I like some of the extreme effects especially if zoom or motion blur is used afterwards). 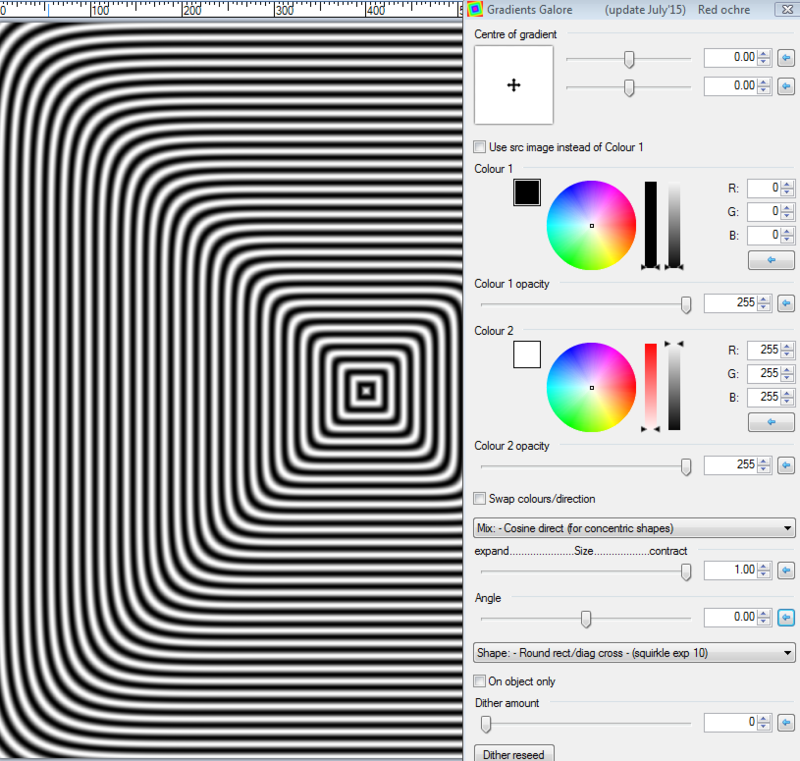 I've found normal smooth dithering is achieved around a value less than 15. 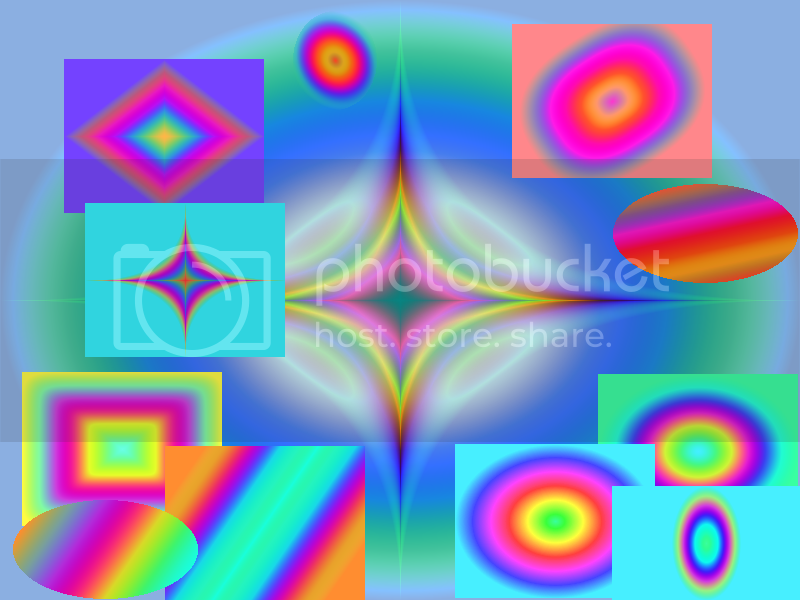 HSV rainbows, clockwise and anti clockwise. my own BGR spectra, (6 variants). These can give some interesting tertiary colour spectra, (try grey to grey). an ability to write on objects only, (quick way to do rainbow text). 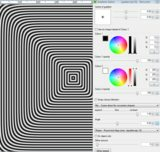 sliders to set start and end transparency, (useful for 'filter' layers). 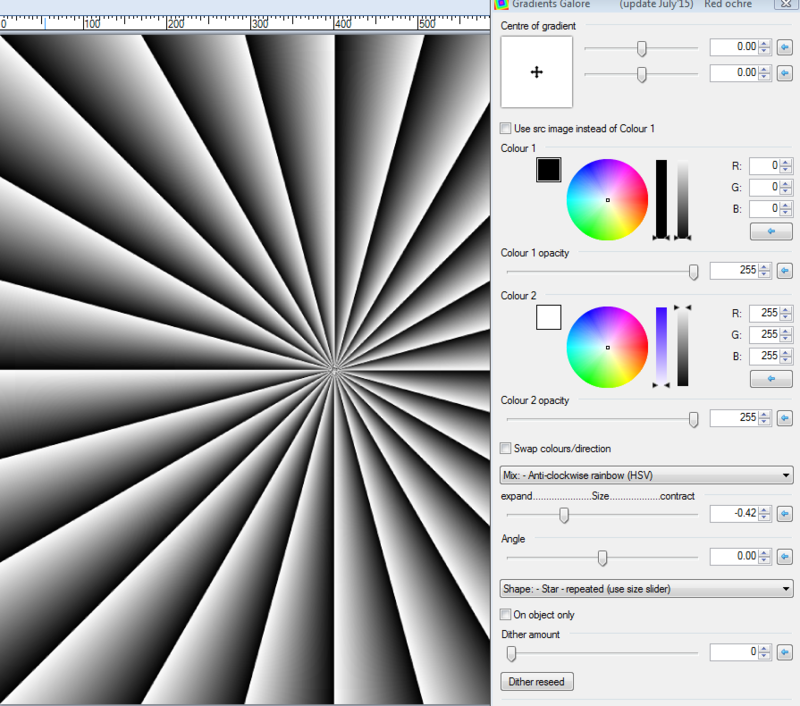 use the source image as the primary color,(useful for transparency gradients). 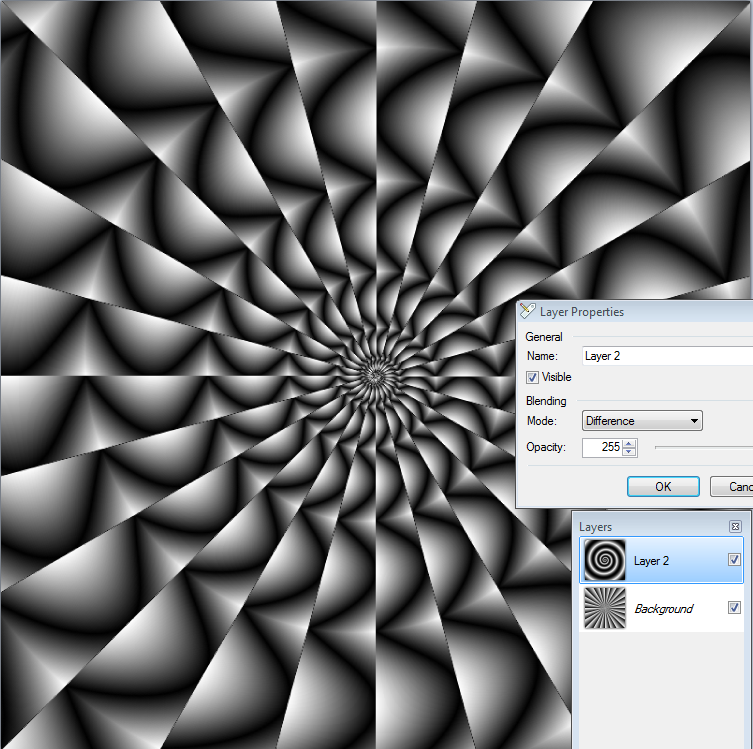 angle slider (rotation around canvas centre). 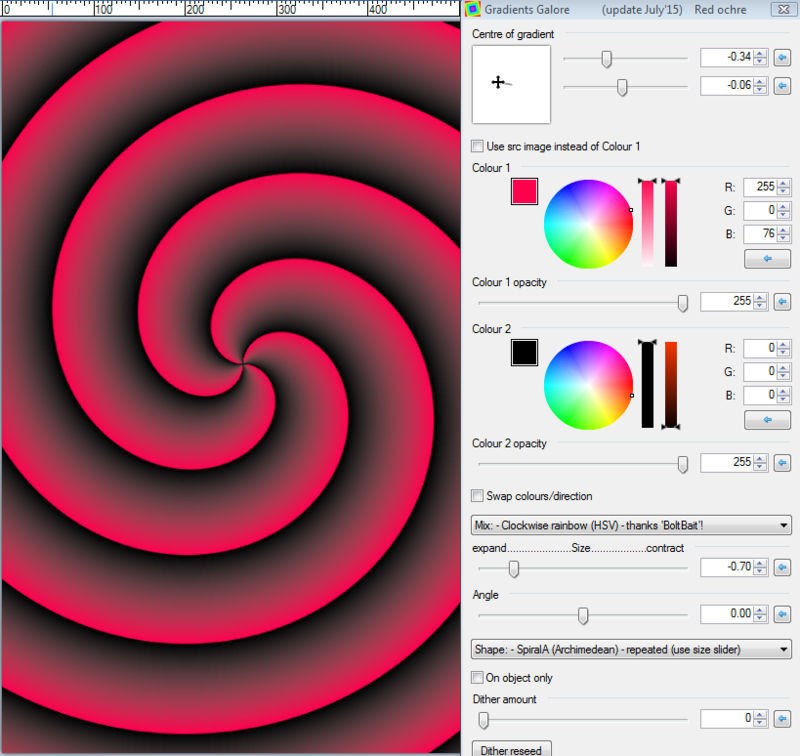 It works well inside selections and the gradients can be rotated too. Pictures speak louder than words, so I hope the screen shots help. Any feed back appreciated - I haven't put this in my pack yet so if anything needs changing please let me know. Have fun with this and post any interesting creations here - Enjoy! This looks like multicolored fun! Sorry, but I can't approve of this plugin as long as my name is misspelled. Looks great Red Ochre! Will have a play when I get a chance. Love colour!! Sorry BoltBait - I didn't realise you where so case-sensitive - and who is Miss Pelled anyway? All the best Red', Red Ocher, Red ochre, Red Ogre ! Nice plugin! 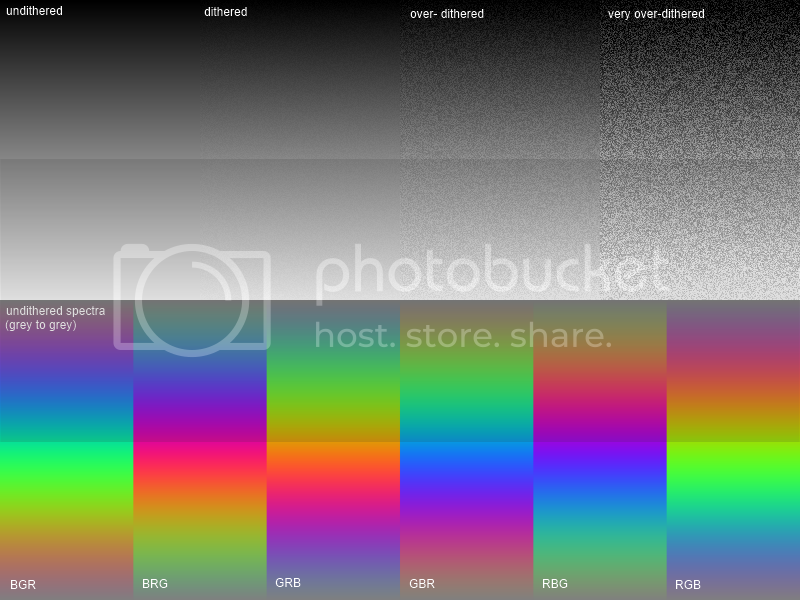 Dithered gradients = good! Yet another cool plug-in.I am liking the look of the over dithered texture so I am away to play with it.Cheers Red Ochre and thanks for sharing.Nice One! 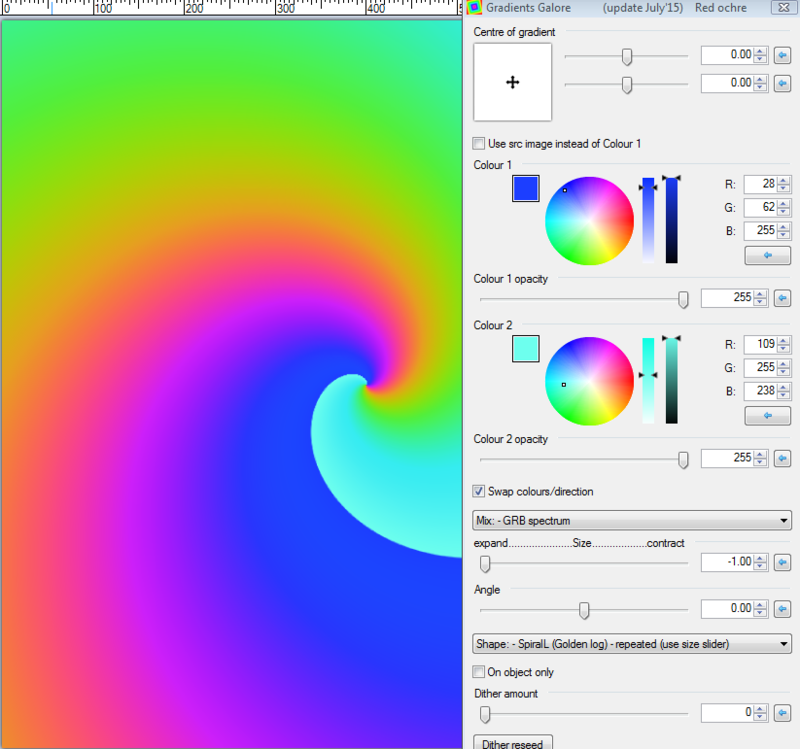 I think this is the best Gradient plugin currently available. 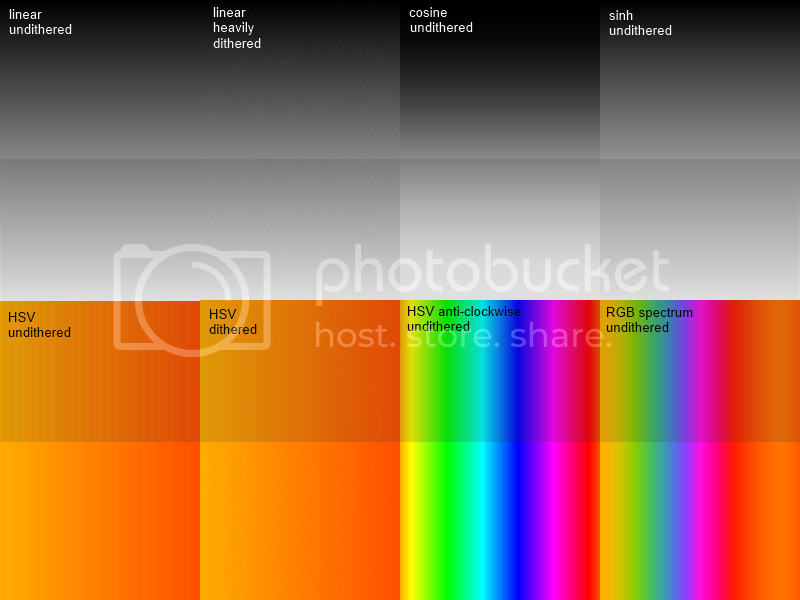 Anyone who uses gradients needs this... The dithering is a time saving feature. Many thanks Kirby145 and nitenurse79 - glad you're finding it useful , and really good to get positive feedback. 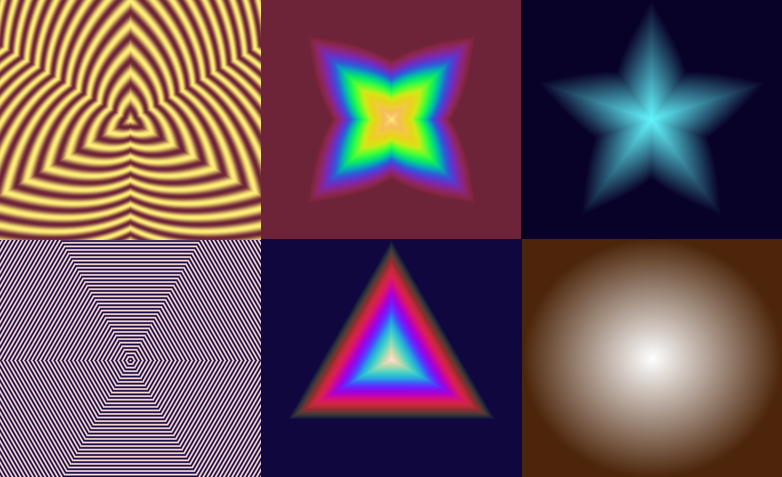 (by the way, I have'nt added it to the plugin pack yet as I may [or may not] add some more gradients [if I can work out the maths!]). 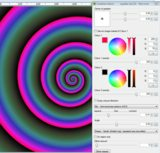 'fainter' P.M'ed me a while back asking for a moveable version of this plugin. I have posted another '.dll' in the first post. I also have some other plans for this so won't be adding it to the pack just yet. Let me know how you get on with this version - it does have a huge U.I - but it fits on my monitor ok! If you prefer the moveable version you will have to manually delete the fixed version's .dll from the effects folder. Hey thanks for that! Looks great. Red Ochre, I always liked the way you put your name up there on the plugin. I'd like to see all plugin writers do this so that we can give credit where it is due. I know some others do too, like pyro. ...I'm never sure what counts as a reply and what counts as bumping my own threads..
A bump is petulant cry for recognition. Pure dead brilliant! Love this moveable version.Cheers Red Ochre. Nice share. I liked your entry for the 'senses' Sig comp btw. Was playing with the movable version and found a bug. I typed in my name, used Object Align then GG(Movable) with 'use source instead of primary color' clicked and got an after effect shown in posted image. I was able to recreate several times. Thanks for reporting that. I've had a quick try to reproduce that and can't? - but I don't have align object installed. Does it happen if you run it at those settings directly on a text layer? 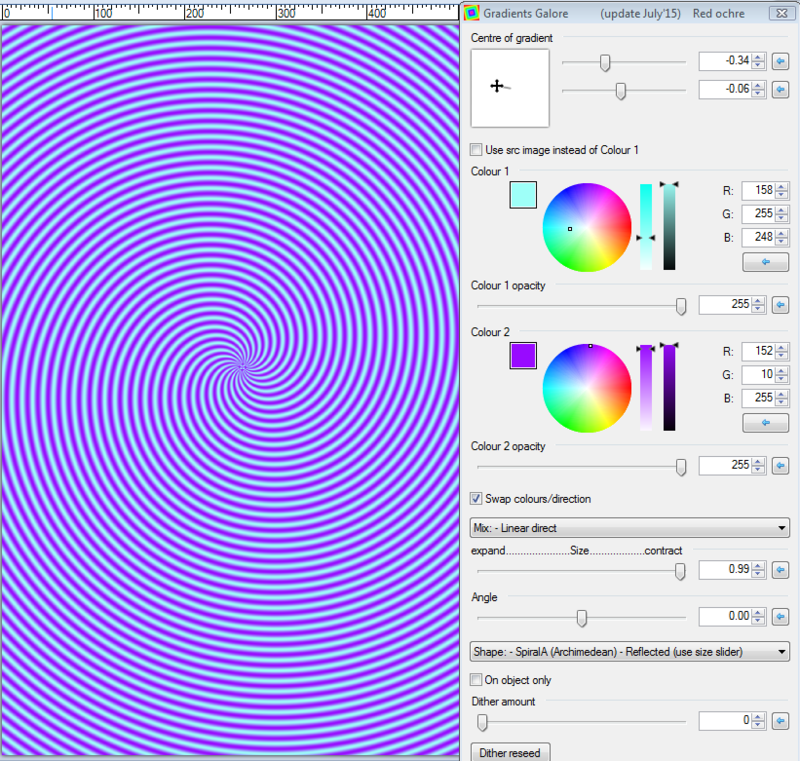 Were you viewing the image full-size (100%) or fit to window, and what was the canvas size? Did the 'artifact' show up when the effect was rendered - after you'd click the 'ok' button? Do you get the same thing happening with the other shapes; ellipse, rounded restangle etc.? Does anyone else get the same problem? That's it. You need Object Align to recreate my problem. 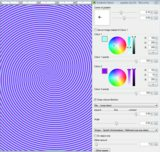 I can type or scribble something off center then use Object Align to center to the middle of the canvas. 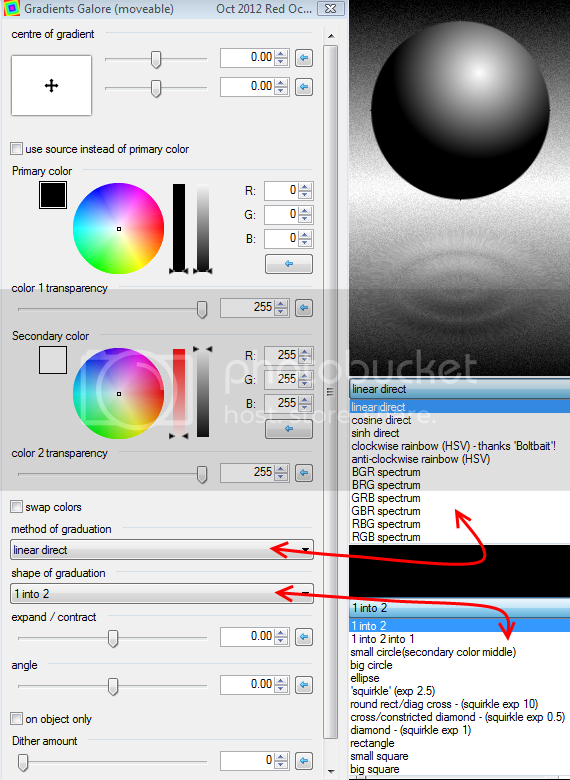 I then bring up Gradients Galore (Movable), click the check box 'use source instead of primary color'. The shadow of where the window use to be appears. Here is another screenshot. Hope it helps. Hi Doughty, thanks for reporting back! I think I know what is going on (but not 100%). I certainly don't want to offend 'moc426' and could easily be wrong. When you create a new transparent layer it is transparent white by default. It looks like align object is only changing the 'alpha' (transparency) to zero when it moves an object, leaving the place where the object was as a transparent black or colour. 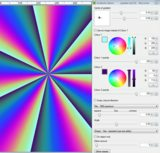 This becomes apparent when running gradients galore because at those settings it is mixing a colour with the background colour, including mixing the alpha value - making the original position of the object visible. If this is the case, I don't want to change my plugin because it is doing what it should. I would also think using align object before any alpha-masking type plugin could be a problem. Try using Boltbait's transparency plugin with the ignore 0 alpha un-checked, make it all opaque and see what is actually on the layer. That doesn't work! 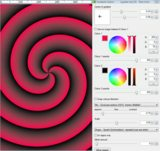 Try my alpha threshold plugin and move both sliders full left. Then click cancel rather than changing the alpha and see if the magic wand can 'find' the artifact,or simply surround it with a rectangular selction then fill it with transparent white. (B = 255,G = 255,R = 255,A = 0). In fact it would quite easy to 'knock up' a plugin to set the colours to white if the alpha = 0. ... bear with me and I'll see if I can write something tonight. Try using this after align object and before gradients galore - let me know how you get on. Edit 16/11/2016, 'Object2Colour' (in my plugin pack) contains an option to 'clean' the background on object layers. Your Alpha Threshold with sliders full left changed my shadow solid black and I then used Magic Wand and Delete. Cleanclear worked without any clicking or sliding. Thank you again. I'm happy. My bug showed up in another writer's plug-in this evening. Xhin's Bizarro-Negation. Cleanclear worked for that problem also. Thank you for that plug-in. So, this is definitely my bug. Sigh.